There are bathrooms, and indeed, houses, that do not have room for a bath in their bathroom. 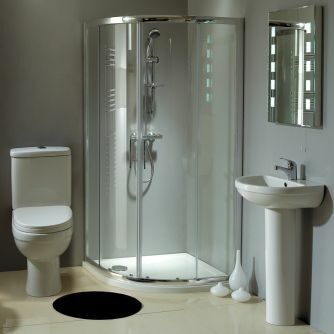 En-Suites are often too small to fit a bath in, so the Shower Suite or En-Suite package has become a standard Bathroom Suite package option of showrooms and retailers. 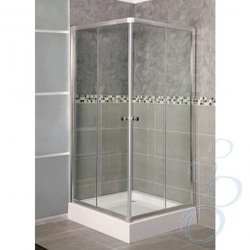 At £390, this 1350mm Walk In Enclosure, which comes n either Left Handed or Right Handed versions, adds a stylish and inexpensive variety of shower enclosure. 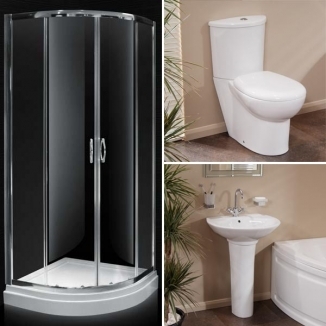 The Prima Aqualine 800 Shower Cubicle Suite features a 800 Quadrant Shower Enclosure with two smooth sliding doors and basin, pedestal, WC pan, toilet seat and cistern. At just £184.95, you won't get many better deals than this to solve an en-suite quandary. The Bruges Square Shower Enclosure including Shower Tray features a corner entry via two sliding doors. At £250, it is fairly standard style that is also available from other retailers featured on this page, sometimes with prices starting at less than £150. The toilet features a dual flush cistern. The Phoenix quadrant enclosure and tray have been crafted to the highest possible standards. The quadrant has a 6mm glass thickness. The shower tray is solid and modern in design. The slim 40mm profile and dedicated integrated waste system make them a desirable option for any bathroom environment.